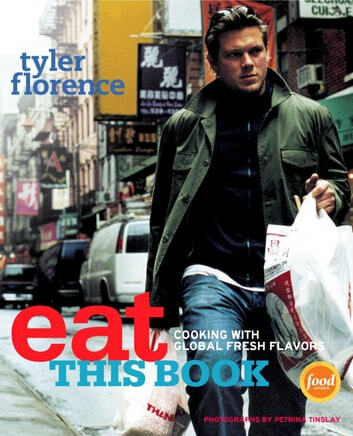 While traveling the globe as the host of Food Network’s hit TV shows Tyler’s Ultimate and Food 911, Tyler Florence developed a unique perspective on how Americans like to eat and cook today—and on how to help them with their daily cooking challenges. In Eat This Book, Tyler draws inspiration from kitchens around the world to enliven America’s favorite foods in more than 150 new real kitchen recipes for everyday occasions. Now you can wake up tired weeknight chicken with the zing of North African spices. Turn Sunday’s same old spaghetti dinner into an authentic Italian abbondanza with Pappardelle Bolognese and Veal Saltimbocca alla Romana. Hit a home run on game day with Fresh Tortilla Chips, Guacamole, and Farmstand Salsa. Each recipe zeroes in on the bright notes of fresh, global fare and a handful of readily available ingredients that engage the senses and spark the palate, and all are as easy to prepare as they are flavorful. Packed with the excitement of a culinary wanderlust fulfilled and all the comforts of coming home again, Eat This Book proves there’s really no reason to eat out when the food from your own kitchen can be so delicious.